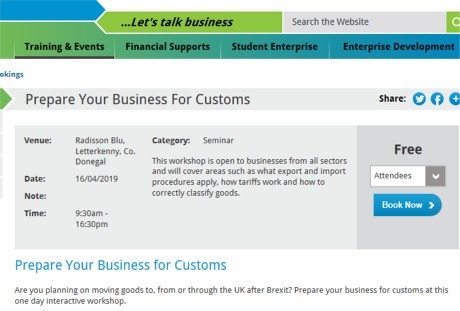 FOLLOWING a hugely successful workshop on helping businesses in Donegal get Brexit ready by helping them prepare for customs, Local Enterprise Office Donegal have added a further two workshops on Prepare your Business for Customs - Getting Brexit Ready over the coming weeks. The feedback on the first workshop held in March was very positive, with 30 local businesses engaged on the six steps to prepare their business for Customs after Brexit and because demand has been so high, further events are now scheduled for Tuesday 16 April in Letterkenny and Thursday 9 May in Solis Lough Eske, Donegal. Businesses in Inishowen who are planning on moving goods to, from or through the UK after Brexit are being urged to prepare by attending the one day interactive workshop, but with demand for the limited places, very high – they are being asked to make sure they book in good time. Local Enterprise Office, Donegal, have stressed that the workshop is open to businesses from all sectors. "If the UK leaves the Customs Union and Single Market, it will become a 'Third Country' for customs purposes. At this workshop businesses can learn about the potential impacts, formalities and procedures you will need to adopt when trading with a country which is outside the Single Market and Custom Unions (a 'Third Country')," Head of Enterprise in Donegal, Michael Tunney said. He added "It will cover areas such as what export and import procedures apply, how tariffs work and how to correctly classify goods." Places are booking up fast, so interested Inishowen businesses are asked to book online or call 074 91 60735.